Pancreatin is secreted in a large gland in the body called the pancreas. This digestive enzyme is used to supplement a loss of or low production of proteins in the body. It has shown results in helping in the betterment of food allergies, celiac disease, autoimmune disease, and cancer and weight loss. It is composed of amylase, lipase, and protease. The function of amylase is to break down starch that of lipase to break down fats and that of protease to metabolize complex proteins. The two essential functions of pancreatin in the body are the proper digestion of food and a routine eradication of cancer. The enzymes not just contained in pancreatin but otherwise to act as a catalyst in the body and regularize the metabolism of the body. The proteins are involved in the process of catalyzing the hydrolysis of fats into glycerol and fatty acids and protein into proteoses. They convert starch into dextrins and sugars. Artificial injection of pancreatin is required for patients with cystic fibrosis. These patients have malabsorption of food in their body which can be due to excessive secretions from the pancreatic gland. The best time to take a dose of enzymes is before, during or immediately after a meal. It is advisable to swallow the pills and not chew them. Pancreatitis, a disorder caused due to the malfunctioning of the pancreas, is treated with regularized doses of pancreatin. It is advisable to take pancreatin supplements orally. However in the case of children especially before giving them these supplements a health care professional needs to be consulted. If the person misses a dose of pancreatin, then it should be taken as soon as it is remembered but if it is time for the second dose then don’t take a double dose. Excessive dosage of pancreatin can result in gastrointestinal adverse effects like nausea, vomiting, diarrhea and abdominal pain, etc. 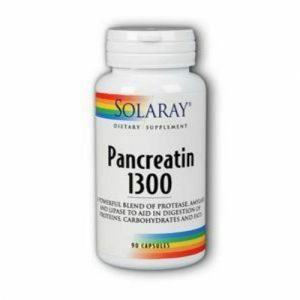 There is considerable evidence in support of the beneficial effects of pancreatin which is a proteolytic enzyme both natural and supplemental. The primary function of these kinds of enzymes is to help in the betterment of digestive disorders. It is very useful in dosage when malabsorption in the body is owing to reduced exocrine pancreatic function. Exocrine pancreatic insufficiency coupled with pancreatic pain and endocrine pancreatic insufficiency are the symptoms of chronic pancreatitis.